Tyrannosaurus rex bite marks have been found on the fossilized bones of Triceratops horridus, but so far such fossils have been studied in an isolated manner. In new research, scientists worked on numerous specimens from Montana’s Hell Creek Formation to identify the tooth marks of T. rex and how it ate T. horridus. The scientists presented their findings at the Society of Vertebrate Paleontology last week in Raleigh, North Carolina. In total, they found 18 specimens that had teeth marks. None of the bones showed any signs of healing, indicating that the bites were inflicted on dead animals as they were in the process of being consumed. The bite marks included extensive puncture and pull marks on the neck frills on some of the specimens. The pulling action was probably not indicative of being eaten, but a repositioning of the prey. It suggests that T. rex was trying to get at the nutrient-rich neck muscles. This is probably the easiest way to pull the head off, explains Denver Fowler, from the Museum of the Rockies in Bozeman, Montana. T. horridus‘ occipital condyles had teeth marks as well. They could have only been made if the animal had been decapitated. This work shows the value of incomplete specimens and large samples for interpreting palaeobiology, states Andrew Farke, paleontologist at the Raymond M. Alf Museum of Paleontology in Claremont, California. There were precise, even delicate bites, along the front of several T. horridus skulls, suggesting that the nibbles were done on the meaty part of the face. 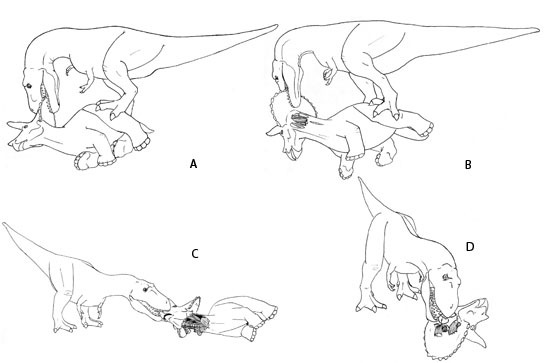 This led Fowler to question whether the feeding behavior of T. rex changed as the animals grew. With thick teeth, adult T. rex would have been well-suited to tear apart T. horridus, whereas juveniles may have had to rely on different feeding strategies to avoid damaging their teeth. Be the first to comment on "How Tyrannosaurus Rex Ate Triceratops Horridus"